As Europe’s top club competition the VELUX EHF Champions League completes the first 10 rounds and 140 matches. Now EHF Marketing GmbH takes a look at the highlights so far. 38 TV partners are broadcasting the 2018/19 season to more than 80 territories this season, with worldwide coverage also guaranteed via the EHF’s own OTT platform, ehfTV.com. There have been two stand-out matches: in the first round in Mannheim (Rhein-Neckar Löwen vs Barça Lassa) and in round 9 (Rhein-Neckar Löwen vs Telekom Veszprém), both covered by 24 broadcasters. The huge interest in handball in Denmark also continues to drive TV audiences to the country’s public broadcaster, DR. The match Skjern Handbold against Paris Saint-Germain Handball notched up a market share of no fewer than 40%. Complementing the competition’s extensive broadcast agreements, fans can also follow across a range of a social media channels. More than 90 million impressions were recorded so far this season on the main social media platforms, Instagram, Facebook, Twitter and YouTube, as investment in additional digital content pays off. Carlos Ruesga’s last-second goal against Chekhovski Medvedi (Round 2) has been the most successful video in social media for the first part of the season with 1 million views. The faces of the competition, Hannah Jackson and Markus Floth, continue to play an active part in the success of the competition’s digital coverage. Travelling to each Match of the Week (MOTW), they bring fans the latest news and stories from every host city via social media, offering fans a glimpse behind the scenes not normally shown on TV. The MOTW visited eight different countries and nine different clubs so far. Off the court, this season has already been hailed a success. With the introduction of two new sponsors at the start of this season, Nord Stream 2 as premium sponsor and Betano as regional betting partner, the Marketing rights for the VELUX EHF Champions League are officially sold out. Plan International – the competition’s charity partner – brought pink to the competition in celebration of the Day of the Girl Child in the fifth round, and regional premium sponsor Gorenje continues to promote its award-winning #simplyfans campaign. The European top flight now takes a winter break, resuming again in February. 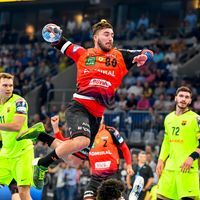 The final aim for every team is a place in the 10th edition of the VELUX EHF FINAL4, which will be played on 1/2 June 2019 in the LANXESS arena in Cologne. Fans still have a chance to experience Europe’s most spectacular indoor sport event for themselves. The next batch of tickets will go on sale on Thursday, 6 December 2018 at 10:00 hrs.